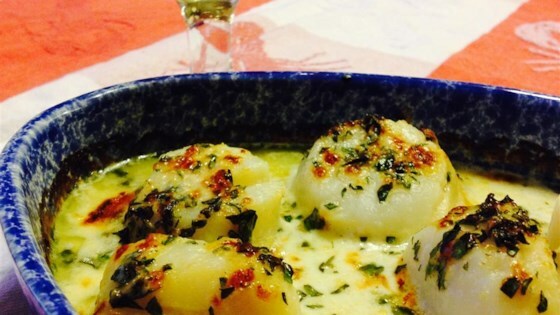 "As far as I'm concerned, a simple gratin is the most delicious way to cook fresh scallops. The only real way to screw this recipe up would be to use the wrong scallops. And by wrong, I mean any scallops that have been soaked in a preservative brine. These are easy to identify, as they're usually sitting in a pool of milky liquid. What you want are usually sold as wild 'day-boat,' 'diver,' or 'dry-pack' scallops. They are really expensive, and worth every penny. Serve with French bread for dipping." Preheat oven to 450 degrees F (230 degrees C). Brush 2 small gratin dishes with 1 tablespoon melted butter. Whisk creme fraiche, white wine, lemon zest, cayenne pepper, and kosher salt together in a bowl until sauce is smooth. Place scallops in sauce and toss to coat; let sit until flavors begin to blend, about 5 minutes. Divide scallops between prepared gratin dishes and pour remaining creme fraiche sauce over the top. Top with tarragon and Parmesan cheese. Drizzle remaining butter over the top. Bake in the preheated oven for 4 minutes. Increase oven setting to broil and continue cooking until scallops are golden brown, slightly springy, and opaque, 2 to 4 minutes more. no i didn't make any changes and it came very good will make again, and share it some friends. My husband loved this! My kids not so much. This my first time making scallops (SO expensive!) and I'm glad it turned out well. Will definitely make again! Thank you, Chef John!